Senior Years is a time of growing in personal responsibility, of advanced learning, the setting of life goals and of spiritual growth. It is an exciting and fulfilling three years as students approach their graduation. The Senior Phase of Learning is both a challenging and exciting journey for young adults. In Years 11 and 12 students step into the pathways that will lead them into the world beyond schooling. During this journey, students develop their whole selves – academically, socially, emotionally, spiritually and physically as they participate in College life. It is our goal to assist students to grow in their character, their faith, and their learning. With regards to academics, the Senior years at Suncoast provide the depth and range of study required for students to be well prepared for employment and tertiary education. Subjects reflect the growing maturity of students and prepare students for a changing world, through the development of the 21st Century skills which underpin the Senior subjects. 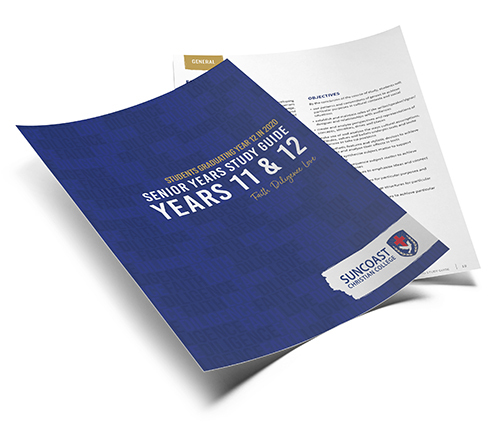 Download our Study Guide for Years 11 and 12. Queensland is currently transitioning to a new system of assessment and tertiary entrance with two methods of assessment in operating concurrently for students graduating Year 12 in either 2019 or 2020 and beyond. Students completing Year 12 in 2019 will be the final cohort to graduate under the current tertiary entrance system of OP or Selection Rank. Eligible students are awarded the Queensland Certificate of Education (QCE) when the set amount and standard of work is met. Students study 6 subjects: English and Mathematics, and 4 electives. Six subjects can include English Communication, Pre-Vocational Maths, and any number of Certificates OR Traineeship. Students in Year 11 in 2019, and graduating Year 12 in 2020, will be the first students to commence in the new Queensland Senior Assessment and Tertiary Entrance System. While students will still work to achieve the Queensland Certificate of Education (QCE), tertiary entrance will change to the Australian Tertiary Admission Rank (ATAR). Suncoast offers three of the QCAA developed types of senior subjects — General, Applied, and where necessary, Short Courses. Results in General and Applied subjects contribute to the award of a QCE and may contribute to an Australian Tertiary Admission Rank (ATAR) calculation, although no more than one result in an Applied subject can be used in the calculation of a student’s ATAR. Typically, it is expected that most students will complete these courses across Years 11 and 12. All subjects build on the P–10 Australian Curriculum. General subjects are suited to students who are interested in pathways beyond senior secondary schooling that lead primarily to tertiary studies and to pathways for vocational education and training and work. General subjects include Extension subjects. Applied subjects are suited to students who are primarily interested in pathways beyond Senior secondary schooling that lead to vocational education and training or work. Short Courses are only offered to students who are unable to achieve success in General or Applied subjects. These have been developed to meet a specific curriculum need and are suited to students who are interested in pathways beyond senior secondary schooling that lead to vocational education and training and establish a basis for further education and employment. They are informed by and articulate closely with, the requirements of the Australian Core Skills Framework (ACSF). A grade of C in Short. Courses align with the requirements for ACSF Level 3. Suncoast has a range of Vocational Education and Training opportunites which provide our students with great pathways into the workforce and further education. 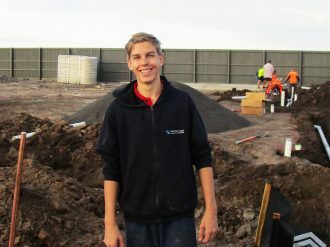 Suncoast has offers for school based trainees and apprentices which allows students to combine work and study – and to get into the workforce sooner. Recreational and competitive sport occurs in the timetable for all students. In addition, teams of Senior students compete against other Independent schools in Touch, Rugby, Football, Volleyball, and Basketball. An extensive Voice and Instrumental Program (SunArts) supports performance opportunities at Chapels, Assemblies and special events such as the Onstage variety concert, the biannual musical production, Easter and end of year celebrations. Chapel Bands, the Performance Band and Dance Company provide a world of performance opportunities. Many students also choose to participate in the Voice and Instrumental program’s (SunArts), Speech, Drama and Dance classes, offered at the College.